Diamond Queen is a 5 reel, 20 payline slot game that comes from the brains at online slot developer IGT where releasing top class slot games seems to be a force of habit over recent years based on other titles including the Egyptian-themed Crown of Egypt and the Greek mythology themed Treasures of Troy. This slot has a lot to offer and is an intriguing slot released by IGT. It has a mystical theme and has a special bonus feature that gives you a great chance of winning a big prize. This is certainly a slot for fans of the fantasy-themed slots and there is a lot of magic and intrigue surrounding the reels from the minute you load it up. The main bonus feature in Diamond Queen is the Mystical Diamond Bonus feature. This feature is triggered when you hit three Mystical Diamond Bonus symbols on reels 2, 3 and 4. This is where the fascinating Locked Wild Reels and Stacked Symbols come into play adding an extra element to the game play. The feature starts with the 2nd reel remaining entirely Wild for the first free spin and staying Wild for the remaining spins. For the second free spin, the 2nd and 3rd reels are Wild with both reels staying Wild for the remaining free spins. The third free spin then has reels 2, 3 and 4 completely Wild. There is the opportunity for you to hit an Extra Spin symbol during the free spins on the 1st reel which will allow you to add one more free spin at the end of your free spins in the Mystical Diamond Bonus feature. It is possible for you to win up to 20 extra free spins. Look Out for the Diamond Queen Wild! The Wild symbol in Diamond Queen is represented by the Diamond Queen herself. It substitutes for all other symbols except for the Scatter symbols to complete winning combinations. It only appears on the 2nd, 3rd, 4th and 5th reels. 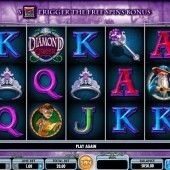 Diamond Queen is a top draw slot that offers the graphics and game play you would expect from an IGT slot. The mystical and magical imagery is enchanting and the Mystical Diamond Bonus feature is a great chance for you to win big. The pay outs are inconsistent but lucrative at their best which makes it worth the time and effort. IGT took on a brave task by releasing a mystical themed slot but in my opinion it has just about paid off. 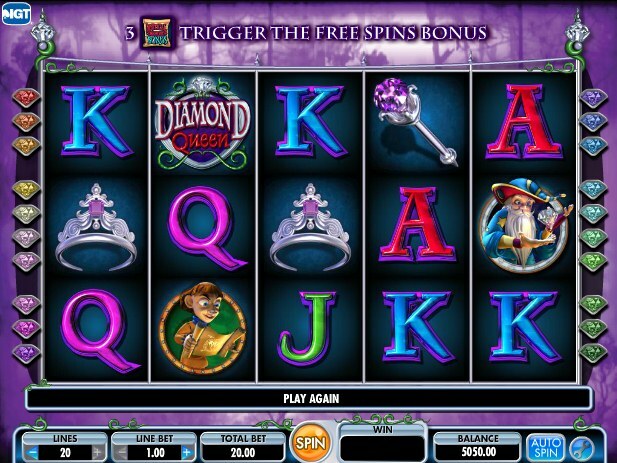 Maybe adding another level to the bonus feature could have taken the slot to a higher standard but for what it is, Diamond Queen is a slot that has a lot to offer.